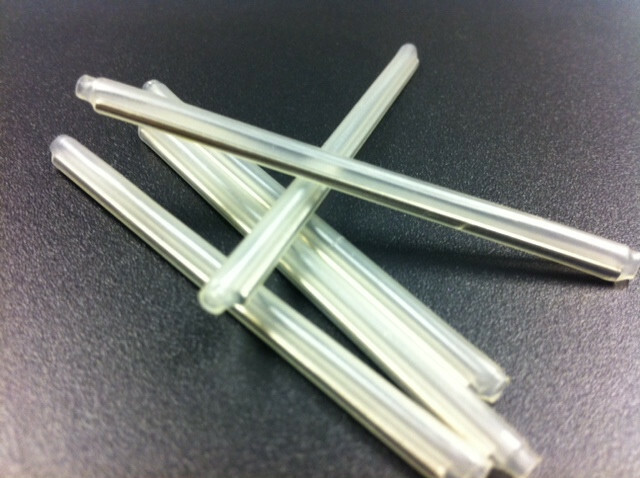 A 23mm specially designed cross-linked polyolefin tubing system, with meltable liner, providing strength and protection to optical fiber splices. Various Pack Sizes. Order up to the next price break at 100 Pcs. A specially designed cross-linked polyolefin tubing system, with meltable liner, providing strength and protection to optical fibre splices. Splice protector is specially designed for fibre optic cable. This splice protector consists of a cross-linked polyolefin sleeve for protection, a steel rod (ceramic rod for ribbon fibre) for reinforcing the splice and hot fusion tubal insert for rebuilding the coating of the fibre. This protector provides mechanical reinforcement at a joint point and maintains the optic transmission properties of the fibre optic cable. Keeps optic transmission properties of the optical fibre. Easy to use and minimize damages to optical fibre during installation. Clear sleeve for easier inspection. One piece design with hot fusion inserts for sealing against moisture and other contaminants. Splice Protection sleeves are used to secure connections in fibre optic splice closures as well as 19" rack fibre optical distribution panels, stand and wall box. The stiffness of connection and quickness of assembly are the main advantages of this solution. Excellent climatic and thermal properties make it ideal for use in closed as well as open spaces. The main goals during design phase were: full protection of the fibre optic splices, a stiffness of connection and short assembly time. They do not cause additional insert losses, and they offer protection against mechanical damage, pollution and weather conditions. Our Splices are of High Quality and Low Cost that gives you the best results every time. For further information please contact our sales team.